My first encounter with Nick Goss’s work was when someone showed me a photo on an i-Phone in a pub. I was instantly captivated by his elusive, yet enigmatic, style of painting. Not much art can really grab your attention from a phone screen but there was something about these works that left me wanting more. The ghostly textures pulled me in and the more I heard about Nick, the more I wanted to know. Nick Goss, Dockery Plantation, 2009. Image via www.joshlilleygallery.com. Over the last year I’ve seen a range of his pieces at the Josh Lilley Gallery and he has also produced a response to be included in In Conversation with Stuart Sutcliffe which opens in April – how did that come around so quickly?! It was because of this exhibition that I ended up trying to find my way to his studio today. Getting out at Elephant & Castle I was instantly disorientated. It’s another one of those stations where I never use the right exit and never end up in the right place. After several failed attempts, and having crossed the roundabout three times, I set off in the wrong direction. Finally I managed to get it right but half way down the New Kent Road, a taxi came to my rescue (again). And, thank heavens it did, as the studio was much further away than I had anticipated. When will I learn? 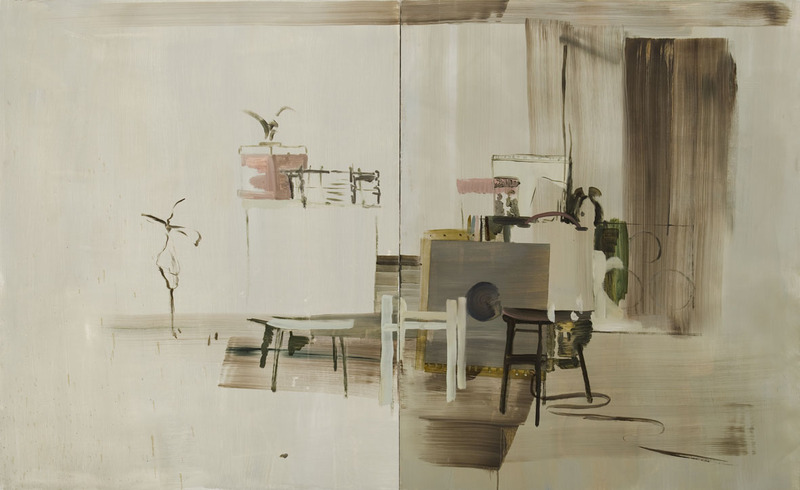 Nick Goss, Casbah, 2011. Image courtesy of the artist and via www.stuartsutcliffe.org.uk. I arrived quite late and frazzled but walking into Nick’s studio had an instantly calming effect as the smell of oil paint wafted over to meet me. Everything seemed right and I was greeted by Casbah – the work that will be included in the Sutcliffe show. For this, Nick went up to Liverpool on a Stuart Sutcliffe research trip to get fully in the mood. As well as being an artist, the multi-talented Nick plays in the band, My Sad Captains, so the combination of art and music in ICWSS particularly appealed to him. His band has been described as lonesome and groovy with a warm dynamic range; his music elicits very similar emotional responses to those of his artwork. Over the last year, Nick has been using board more than canvas, experimenting with block shapes as seen here. His work has developed a long way, without losing any of its potency. 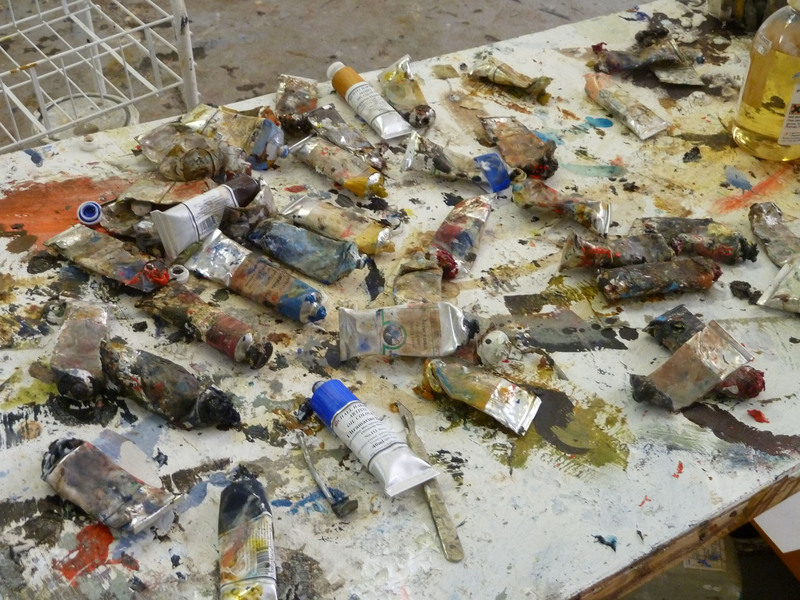 Nick Goss’s studio. Own photograph. Casbah looks at how the reality of being a musician is often so different to the imagined ideal. Nick wanted to investigate the associated detritus of playing in a band and the sort of rehearsal spaces and small venues that the Beatles would have confronted on arriving in Hamburg. When devoid of players and instruments, these spaces have a peculiar, melancholic atmosphere. Cheap, simple and limited, these rooms allowed creativity to flourish and promulgated the development of musical ideas. At the studio. Own photograph. 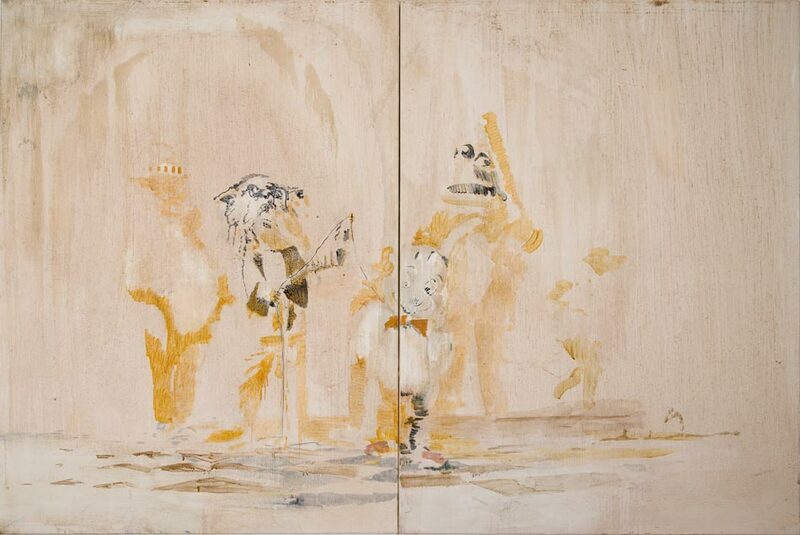 Nick has also painted a companion piece to Casbah, a bigger composition with a different colour scheme and tonality. It’s different but the same, emanating from the same point it is a mirror image of the first composition. 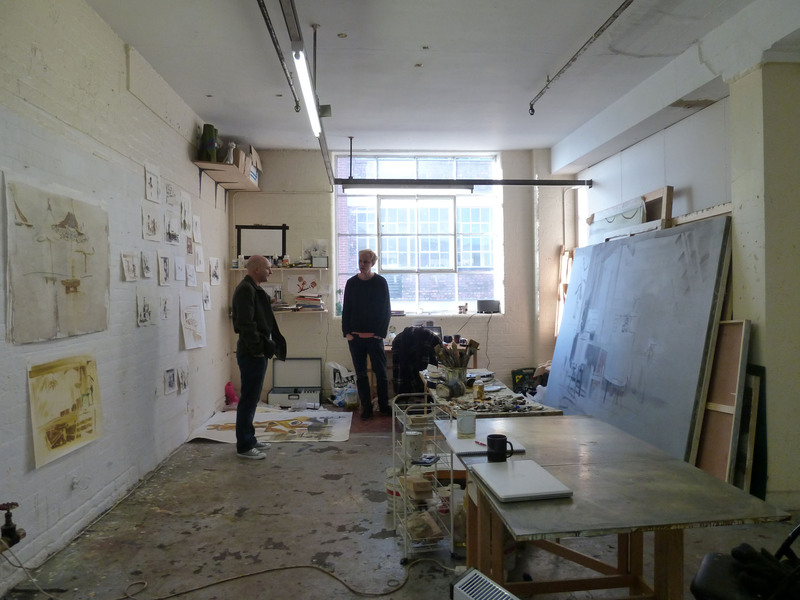 Looking back, Josh Lilley first saw Nick’s work in late 2008 at his studio at the RA. He then included him in his gallery’s inaugural show. Nick graduated in summer 2008 at which time Saatchi began buying his works. Josh had spotted something special and offered him a solo show for April of last year. The rest, as they say, is history. Nick Goss, Everyday, 2009. Image via www.joshlilleygallery.com. Nick’s works play closely on the paradox of observation and memory, purposefully seeking out locations and subjects that co-exist between the landscape and the industrial, the recognisable and the ambiguous. The works include many historical allusions which demonstrate the ability of painting to accommodate the historic alongside the contemporary, and to integrate the conceptual within the visual. Many of his images focus on the remains of a built environment that is abandoned, overgrown or decayed. Nick removes any sense of specificity from these spaces, embodying the works with beautiful timelessness and romanticism in his parallel world. Yet, they are real places with a haunting presence and fading memories. 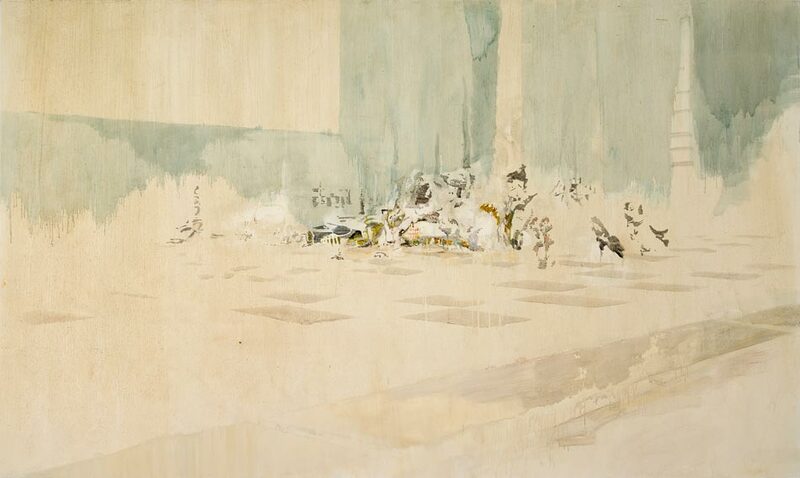 The scenes appear almost overlaid at times as dense textures and thickly-rendered surfaces are covered with delicate washes in dream-like scenarios. Nick Goss, Ringling Brothers, 2009-10. Image via www.joshlilleygallery.com. 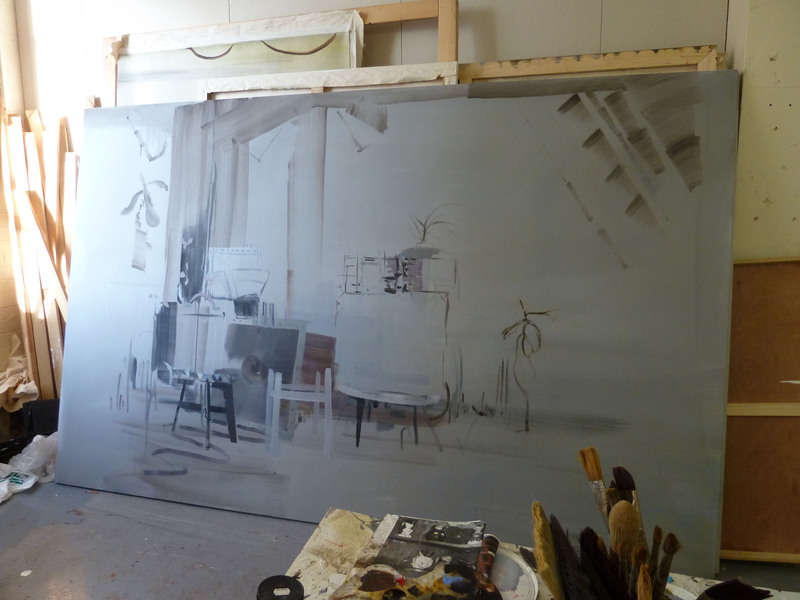 Across the studio, and indeed across his whole oeuvre, Nick’s works range dramatically in size. Whether you’re looking at his intimate watercolours or huge canvases (exceeding three metres), the texture and feel remains the same whatever the scale. 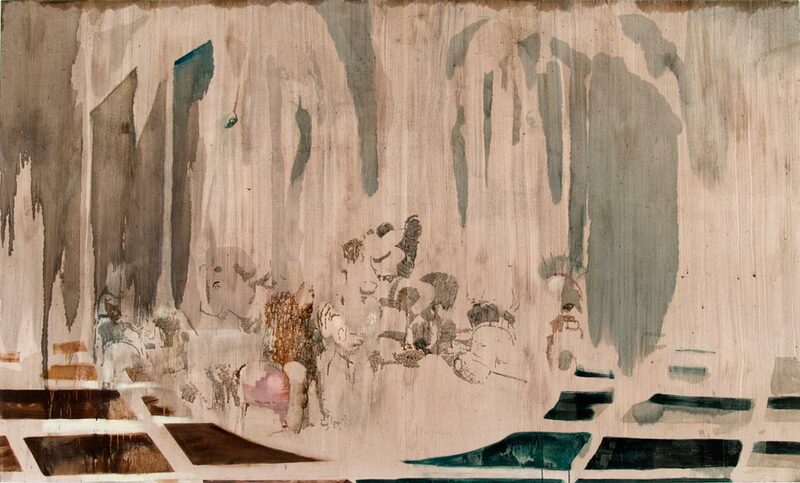 We are not meant to look at these works and identify figures, objects or landscapes. Instead, their elusive presence is intended to fade in and out of our viewpoint. The works are bold yet fragile in their portrayals. Nick’s work fringes on the cusp of memory and imagination, denying space and time. His desolate landscapes are incredibly moving; the geography of the images is both relative and abstract importance especially when viewed alongside the emotional reality depicted in them. The studio had a very conducive atmosphere and I could have happily whiled away the day sniffing oil paint fumes and getting lost in the paintings. Paint tubes jostled for space on a central table next to pots bursting with brushes, and sketches discarded in a corner caught my attention but the room wasn’t cluttered. 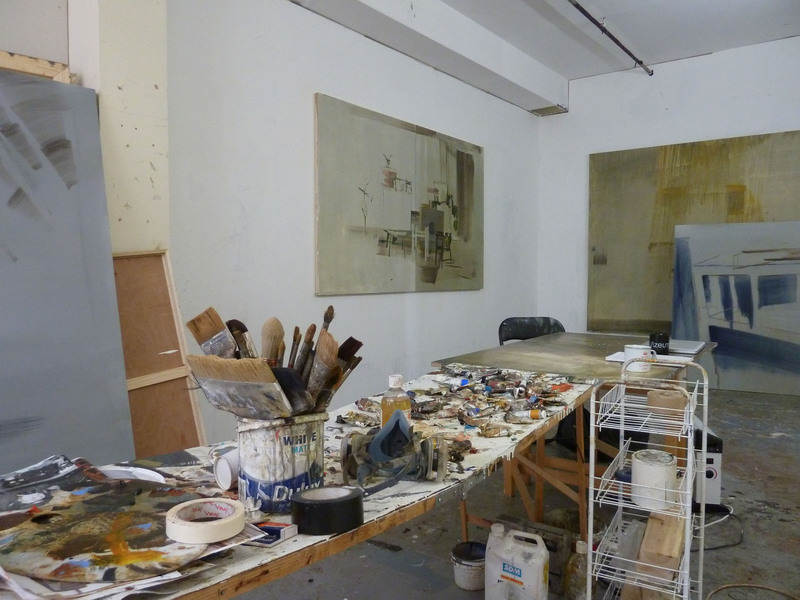 It exactly what you’d expect of an artist’s studio but was personal to Nick in all aspects. 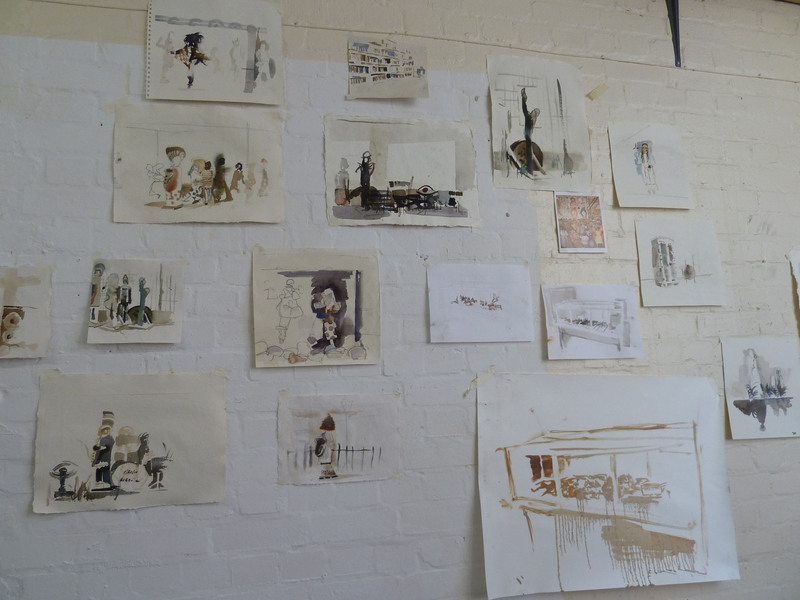 One wall was filled with watercolours on pages torn from a sketchbook, developing the theme of the shabby rehearsal space by adding manufactured models in a study of fakery and idealisation. These drawings are filled with a romantic melancholy, a sense of nostalgia and an elusive sensibility. It was very special to get a feeling for how Nick works and to see his progression of ideas. Watercolours on the wall. Own photograph. Examining the paintings in progress was fascinating. I won’t give too much away – you’re meant to be left wanting more. Nick returns to Josh Lilley for a solo show this October and no doubt these great ideas will have developed and taken shape. This is an artist who is quietly making big waves! For more information about Nick Goss, see www.joshlilleygallery.com/nick-goss or www.stuartsutcliffe.org.uk. Yesterday, after clacking round the King’s Road food market, I popped into the Saatchi Gallery, now housed within a former military barracks off the King’s Road. Duke of York Square Food Market, outside Partridge’s. Image via www.streetsensation.co.uk. It’s a gorgeous building. The rooms are large and light but, without strong works, they can appear soulless and uninviting. These galleries are perfect for strong, large and powerful sculpture and I was eagerly anticipating The Shape of Things to Come. Well, if this is the shape of things to come, we should be concerned as, in parts, this exhibition is worryingly disappointing. Rather than prophesising the state of art in years to come, The Shape of Things to Come spends most of its time looking back, scared to move on. The exhibition takes its name from a work of science fiction by H.G. Wells published in 1933 which speculates on events that will take place up until the year 2106. Wells maintained that the book was his edited version of notes written by an eminent diplomat who had been dreaming visions of a textbook published in 2106. He plays with and distorts these ‘found notes’. This exhibition, showcasing the works of 20 sculptors, is disappointing. A mish-mash of works by some established artists – Rebecca Warren, Roger Hiorns and John Baldessari – is shown alongside lesser-known figures from the Saatchi Collection. I was accompanied by an art philistine, one of those people who aren’t that keen on contemporary art. We walked into the first gallery and the AP loudly exclaimed ‘That’s not art. I could have done that’. I knew, even without some of the dubious pieces on display, that this was going to be tough. 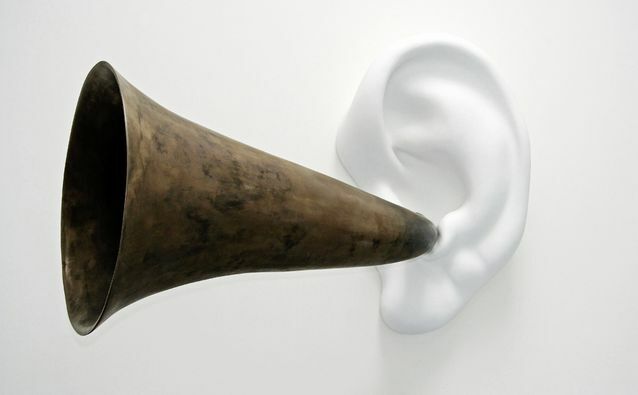 John Baldessari, Beethoven’s Trumpet (with Ear) Opus #133, 2007. Image via www.independent.co.uk. Kris Martin’s Summit (the work the AP will, I’m sure, be beavering away to create this afternoon) shows eight large megalith-like boulders, discovered in Colorado, with a small paper cross resting on the peak of each as an ironic gesture to man hubristically trying to conquer nature. The crosses are so small that it’s easy to miss them which is exactly the point (excuse the pun). Yet, the crosses also call to mind religious meanings; often crosses seen on mountains are where man has himself has succumbed to the elements. 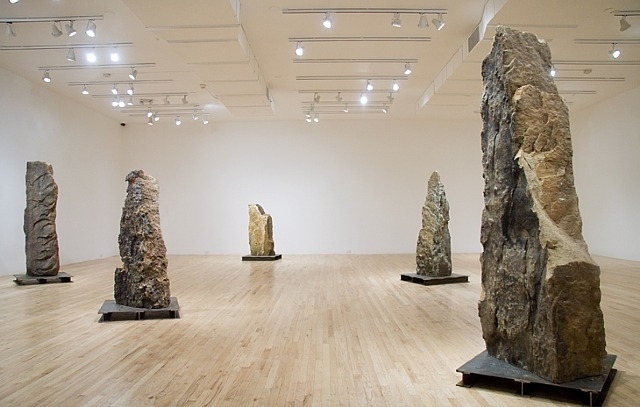 Like many artists (such as the Richard Long at Haunch), Martin has brought the natural world into the confines of the gallery and, interestingly, he has controlled and overcome these boulders by the mere act of transporting them. Now, they represent something far greater. Kris Martin, Summit, 2009. Image via www.artnet.com. It is not only here that found objects have a strong role to play. Triggering debate about appropriation, Oscar Tuazon uses a bed and David Batchelor plays with coloured light boxes and more besides. Dirk Skreber’s installation of two crashed cars turns these familiar everyday objects into twisted distortions, caught in a state of unreal suspension and destruction. ‘That’s not art’ said the AP again. In fact, Skreber’s interest in bending the formal structure of a car without any determined functional sense shows that anything can be used as a medium for sculpture. 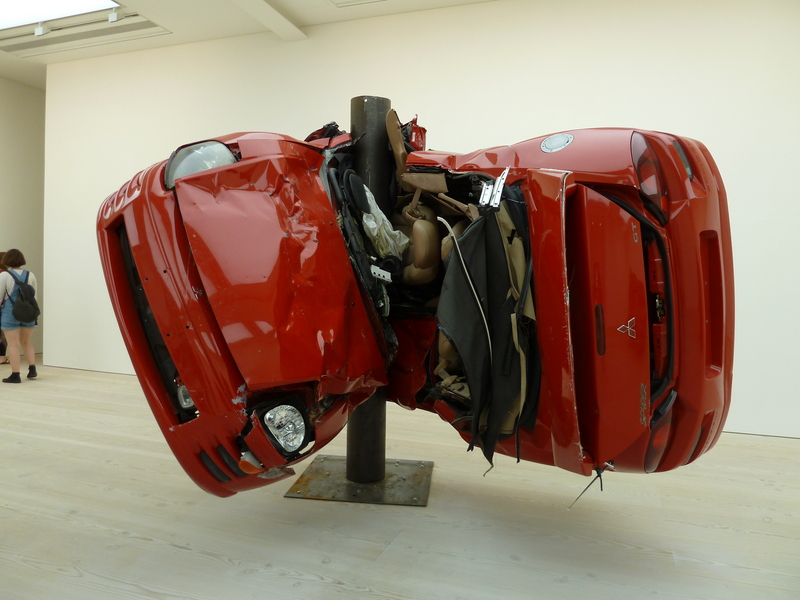 Initially, it is easy to think his sculptures are a comment on accidents (‘That’s just a crashed car’ said you know who) and the dangerous pace of today’s society. On closer understanding these pieces are about the transfer of energy and manipulation of the everyday. Dirk Skreber, Untitled (Crash 1), 2009. Own photograph. Not all of the works here are this effective and, in fact, many left me feeling quite bored. 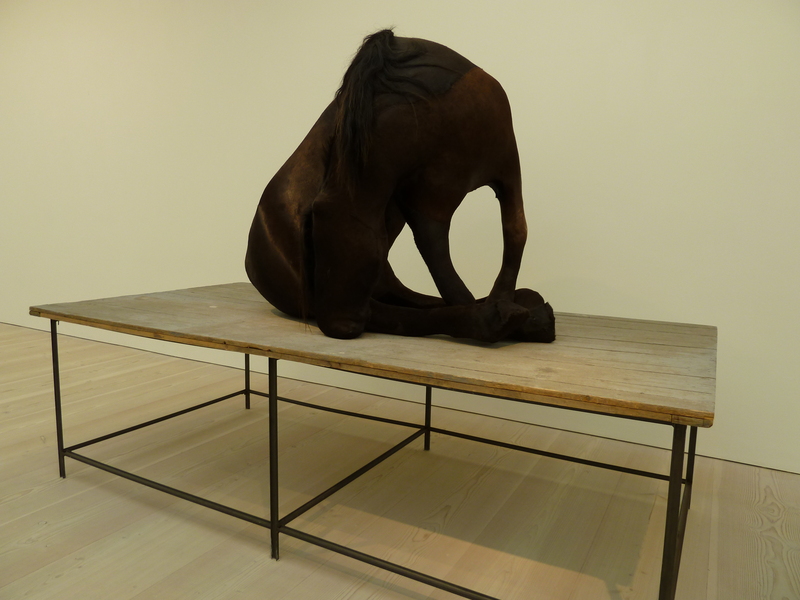 Berlinde de Bruyckere’s sculptures are unnerving but not in a good way. From a distance they look like horses but in actuality they are anatomically impossible, missing a number of the ‘components’ that would make up the animal. Rather they are lumps, genetic engineering gone awry. Berlinde de Bruyckere, K36 (The Black Horse), 2003. Own photograph. Thomas Houseago’s sculptures are about paradox. Intended to be heavy and immoveable yet abstract, fully formed yet unfinished, they are energetic but lacking and their crudity overrules the artist’s sculptural language. Is technical skill present beneath the imposed abstract simplicity? Thomas Houseago’s works. Own photograph. I know all artists are inspired by what has gone before but for an exhibition that is supposedly about forward thinking too many of these works are a rehash of successful pieces we are familiar with from the past. 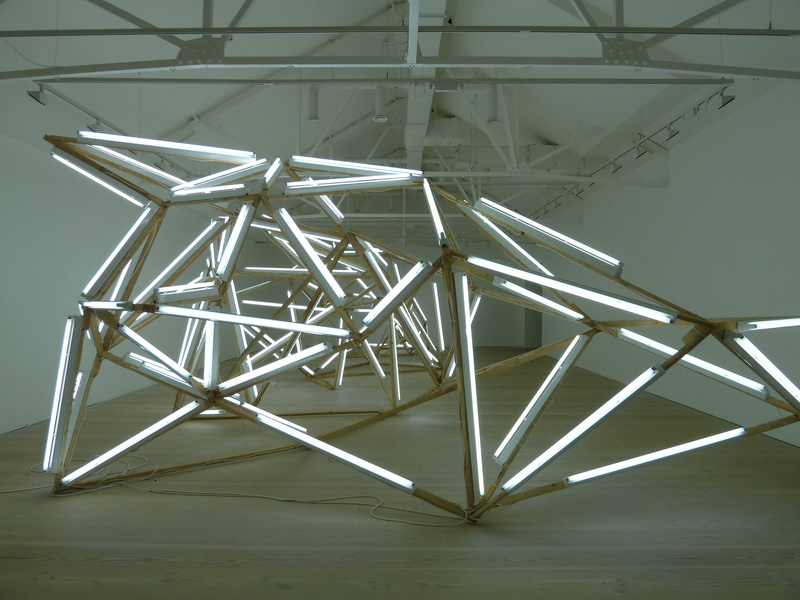 I found it hard to be excited by Björn Dahlem’s The Milky Way, a sprawling web of wood and neon tubes that represent abstract concepts of space and matter, as all I could think of was Dan Flavin. Several of the artists’ works present similar problems. In the same way that Wells used recent history to look forward to the next stage of human evolution, this exhibition is regurgitating ideas from the past 40 years. Whereas Wells’ book was particularly prescient (some even felt he predicted the Second World War), this exhibition is not. Every review references these works to their pre-cursors. Nothing here is new or has the wow-factor. Björn Dahlem, The Milky Way, 2007. Own photograph. There are some good, exciting works but there are also some bad, self-indulgent ones. There certainly aren’t any brave works, there is nothing that breaks the boundaries and pushes sculpture to the next level. I still don’t really know what to think of this but one message remains loud and clear. If you’ve got nothing to say then don’t say it. Under the Saatchi brand name, some of the exhibitors are attempting to re-popularise what people have been saying, doing and thinking for years. It may be good in parts but this is never going to have the impact of Wells’ seminal science fiction. 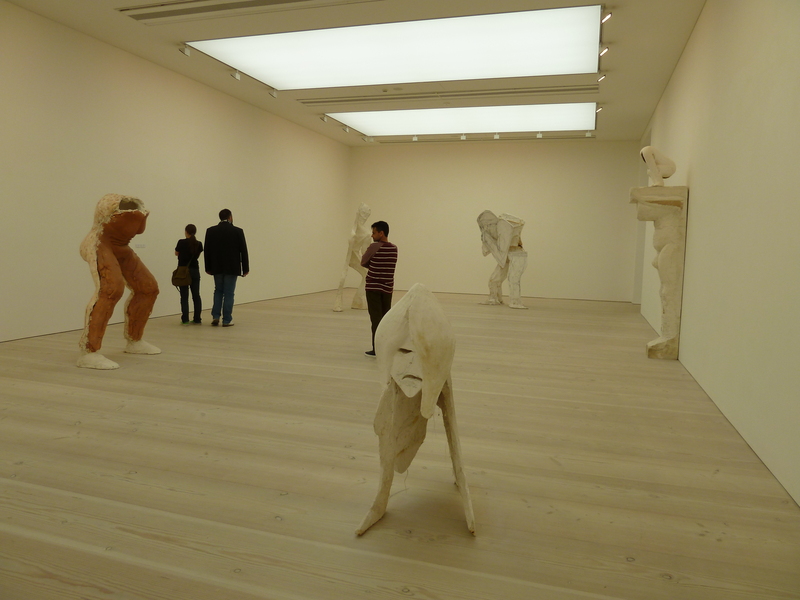 The Shape of Things to Come is at the Saatchi Gallery until 16th October 2011, www.saatchigallery.com.